The odds of a third Epic Mickey game aren't looking too good. The Walt Disney Co. made a lot of noise yesterday about its Skylanders-like Disney Infinity project, but something it didn't say much about was the fate of Warren Spector's much-ballyhooed Epic Mickey 2. For good reason, as it turns out, because according to NPD sales data, it was a bomb. A big one. 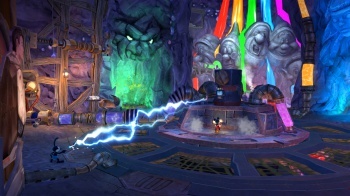 The original Epic Mickey managed 1.3 million sales between its launch in late November 2010 and the end of that year, making it a "modest success," in the words of the L.A. Times. Epic Mickey 2, on the other hand, came out in late November 2012 and managed just 270,000 unit sales by the end of that year. Making the comparison even uglier, Epic Mickey 2 was available for the Wii, Wii U, Xbox 360, PlayStation 3, PC and Mac, while Epic Mickey was a Wii exclusive. Why did it tank so badly? I never played it but Susan Arendt did and in her words, Epic Mickey 2 was a "mechanical improvement" on the original but had none of its charm. "It wasn't endearing. The first one, you wrestled with the controls, but there was love there," she said. "This one? Lifeless. Looked great, played well enough, but a snooze." The report said it's unclear at this point whether Disney will continue its relationship with Spector's Junction Point Studios, but given the performance of Epic Mickey 2 and the company's recent acquisition of Lucasfilm, which includes videogame studio LucasArts, it doesn't seem likely.